We follow ecommerce best practices, including secure encrypted links for our checkout and account pages. Your credit card info is handled securely and never stored on our server. We are located in Canada, so our default store currency is Canadian dollars. We have a currency switcher that allows you to view prices in USD as well as purchase in USD. It’s up to you which you use. When you buy in Canadian dollars, your credit card company or Paypal will do the conversion to your local currency as required. We only use the personal information you provide to us, for example home address, email address, phone number and order details, to communicate with you and to maintain the necessary data retention required of us by tax authorities etc. Our website securely connects to the web APIs of other service providers (eg payment gateway providers Stripe and PayPal, and shipping companies, Canada Post, DHL and Shipstation) to pass along the required information needed to complete and ship your orders. These providers are very serious about keeping these transactions private. We accept credit card payments via our payment gateway, stripe.com. Alternatively, you can pay using PayPal. Your card details go to Stripe or PayPal and are never stored on any servers we control. On our product pages, if we don’t have stock on an item, you will see that it is “available on backorder.” Usually this just means that we don’t have that item built up and ready to ship immediately. In such cases we can usually make the item up in a day or two. Occasionally we are waiting on materials to make a regularly stocked item and that may translate into a longer delay. We generally will post a notice on the product page warning about such situations, but if you have made your order and we expect even a few days delay before shipping, we will advise you promptly, giving you the option to modify or cancel your order as you see fit. Why did my credit card payment not work? When a credit card is used for online purchases, some security checks take place to protect both the seller and the card owner. Payment errors usually result in some sort of helpful message on the checkout page telling you what’s wrong. But they can be confusing. Obviously, the card number, expiry date and the CVV code on the back of the card must all correlate for any payment to succeed. However, a lot of people are not aware that a postal code and sometimes a street address check are made. When the payment processor looks up the details associated with your credit card, it will compare address data it has on file with what you entered in the billing address (not shipping address!) on our North Arm checkout page. If the postal code of the two do not match, the payment will fail. The idea is that if someone tried to use your stolen or lost card for an online purchase, they are not likely to succeed because they’d have to know your address and postal code. Occasionally when people enter orders on our system they fill in the billing address field with where they want the package to go. Instead you should always fill in the billing address to match the credit card you are using and then fill in the shipping address with where the item should be sent. We offer volume discounts depending on the particular product and the quantity you are looking for. Discounts are typically 5% with 3 to 5 pieces of any one product. We can offer up to 10% for larger quantities. Note: not all products are guaranteed to qualify for volume discounts (eg in most cases, sale items would not be further discounted). Once you have contacted us and confirmed your discount, you would then place an order on our web store and add an order note to the checkout page to remind us of the discount offer. We will credit your order by the agreed percentage from the pre-tax item costs and send you an updated invoice. Please contact us with specifics and we will quote you a price. Do you make Custom Knives? We make and sell a set line-up of products, each of which is available in several variations, but we do not do custom designs or alteration of our designs. This is primarily because we make knives on CNC equipment that requires extensive fixturing design ahead of time and is thus not cost effective to the end customer for one-off production. What are those lines on the bevels of your knives? This is likely the most asked question we get about our “CNC finish,” undoubtedly because very few knives look this way. Those lines are made by our computer controlled milling machine. On most knives, the main bevel of the knife is formed by grinding or sanding with an abrasive stone or belt. In contrast, we actually cut the bevel out in tiny steps with our mill. Depending on the model, each successive contour line is between 1 and 2 thousandths of an inch lower than the step above it. Many people wonder if theses small steps help release food. 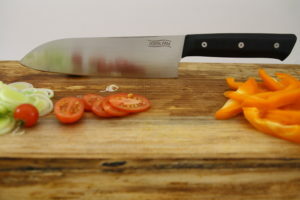 We have had enough customer feedback to say that on the bigger board knives you may notice slightly better food release (than with our satin blade finish), especially with hard, wet items like potatoes. Based on our own every day use, most food items cut the same regardless of the finish. Perhaps this should be expected given the shallowness of each step and the likelihood that soft, wet foods could simply conform to these shallows. How does your handle attachment work? Many of our customers seem curious about our handle attachment system, probably because they can see that the handles have screw heads instead of rivet heads, but they don’t quite get how the attachment works. Our handles are typically attached at two or three points to the blade tang. Each of these points uses three parts: a flat head screw on each side and a round “standoff” inside that accepts the screws at each end. The standoff fits accurately to a matching hole in the tang and protrudes enough from the surface on each side to align the handle scales. The screws tighten from each side, threading into the standoff. We apply a reusable threadlock compound to the screw threads so they do not come apart on their own. We attach our handles with screws so that they can be easily replaced or upgraded, as might be the case if a handle is damaged or the customer wants to switch to a different handle colour or material. Contact us if this is something you need and we’ll let you know what’s available. Most customers, however, should treat our knives as if they had riveted-on handles; there should normally be no need to remove handles and we don’t advise it because the parts are easy to lose. What’s special about your knives? That is almost always the first question people ask, especially if they are aware of our prices, which, though not cheap, are very competitive with higher-end mass produced knives from well known companies in Germany and Japan. Our knives are set apart from the competition by the high quality materials we use, their unique appearance and their small scale, local production. The heart of any knife is the steel it is made from. The steel used in almost all German factory knives has been around for over 3 decades. The steel we use, CPM S35VN, was introduced by its American manufacturer, Crucible Industries, in 2009. CPM S35VN was designed specifically for high end cutlery. Its modern chemical composition and manufacturing process give it significantly better edge retention than the older softer steels used by many knife manufacturers. Great steel means keen edges that last a long time. 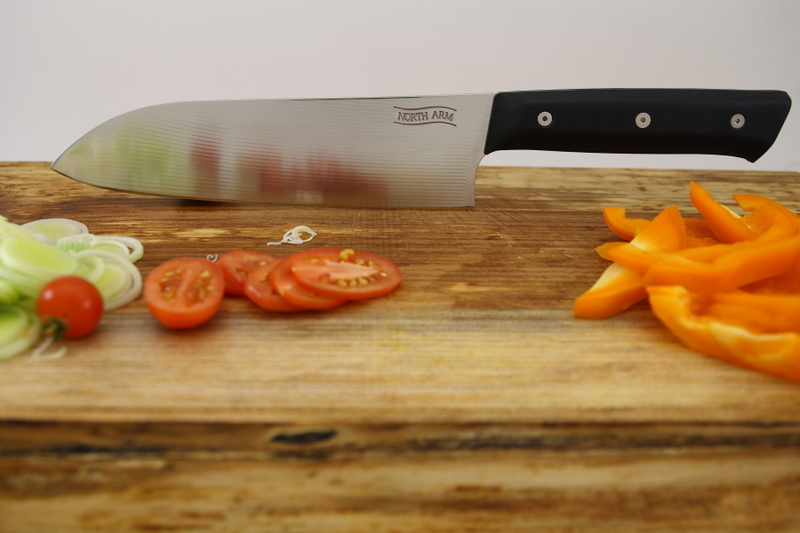 Sharp edges are not only safer to use but add immensely to the enjoyment of meal preparation or any cutting task. Our standard handle material, G10, is another top quality component, used extensively by custom makers and the manufactures of high end production knives. It is an epoxy fiberglass laminate which means it is extremely tough. It won’t crack, crumble or absorb liquids. If you ever did manage to wreck the handle on your knife, we thought of that too. They are attached with stainless steel screws instead of rivets (what most knives use) which makes them easily removable/replaceable. By the way, under the handle scales, in the tang steel we engrave the month and year of production, the model and the type of steel used. For British Columbia residents or tourists to BC, having “Made in BC” engraved on their knife undoubtedly makes for a good story, and certainly makes a great gift. For other Canadians, we’re still sort of local, and for other North Americans we’re still not that far away. For the rest of you, though the distance from us to you may be greater, a North Arm knife still represents an ecological choice because in all likelihood it will be the last one you ever buy. What blade finishes do you offer? Currently, we offer a our standard CNC finish on all models in our lineup. This is our standard finish. The knife bevel is milled as a series of shallow steps (from 0.001 to 0.003 inches each depending on the model). We then polish the bevel with various grits before and after heat treat, ending up with a bright reflective sheen. The CNC lines remain visible, adding a unique texture to the blade. We have not been able to measure any difference in slicing performance between our CNC finish and a typical ground knife finish. However, some customers have reported better food release with the CNC finish on the wider blades (Sitka and Alder) especially when cutting hard and wet items (eg potatoes). What is sheath knife handedness? Sheath knife handedness refers to the user’s dominant hand in relation to a sheath knife. At the moment we offer just one of our sheath knives (the Lynx) in which the sheath is molded differently for righties and lefties. If you choose a right sheath, what you get is a sheath that would be worn on the right hip and be handled with the right hand. The spine of the blade faces forward so when you grab it, it’s in its natural position in your hand. Likewise, a left sheath is worn on the left side and drawn with the left hand. The knife’s spin faces forward, same as for the right. stock level of an item: our web store shows the approximate stock level of an item as well as whether the item is available via backorder. So if we have 3 of something in stock and you want 4, you would still be able to place your order. In such cases we will usually be able to build the model we are short on within 2 or 3 business days and will contact you promptly to provide an ETA. the delay between order placement and shipping it: we ship orders mondays, wednesdays, and fridays (and sometimes more often depending on our production and other activities) so that orders go out within 2 business days from the time you place your order. We will contact you promptly in the unlikely event we can’t meet this commitment. travel time of the shipment: for most destination, we ship via Canada Post using tracked services so you can watch the progress of your shipment. Worst case shipment times within North America are typically a week. If you choose a priority or express shipping option, service will be quicker. We now offer DHL Express service to USA destinations at the same rate as postal shipments. For most metropolitan locations, your package arrives the next business day after we ship. Can you do custom engraving on a knife? We charge extra for engraving. The maximum amount of engraving is a few words. It works best if it can be placed fairly near the handle where the knife is most rigid. If you have something grander in mind, please contact us before you order and we’ll advise if we can do your engraving on the model you are thinking of purchasing. Normally, we only engrave text. You have four font choices: two scripts, a serif and a san serif. If you want to engrave a symbol, we may be able to do it, but you would have to contact us with specifics and it will generally cost more because of the extra CAD work involved. If we have confirmed we can do your engraving and you want to go ahead, just place your order on our website, including your instructions in the order notes area on our checkout page. Be sure to add the engraving fee to your order, one fee for each side of each knife you want engraved. We will send you a proof CAD drawing of where the text will be on the knife and get your final approval. Then we’ll go ahead with the work. It depends on what you’ve ordered and on our workflow, but we can usually turn your order around within a few business days. We ship exclusively using tracked services, mostly via Canada Post . So there will always be a tracking number for you to use to see where your order is. When we create your shipping label you will receive an email with the tracking number. Occasionally, some system along the way will lose a shipping email. If you get an order complete email from us, that generally means we have created the label and are about to ship, which means you should have also received a tracking number email. If you did not receive a tracking number, just let us know and we will make sure you get one. For USA customers, when a Canada Post package crosses the border into the US, USPS takes over tracking, so you can enter the same tracking number into the USPS tracking system to get details of its progress towards you. How do I change handles on my knives? These instructions guide you through how to remove and replace handles on our fixed blade knives. Most people will never have to or want to remove their handles, but you might if you are extremely curious or you want to change handle scales for some reason. The scales are attached with 4-40 screws with hex socket heads. You will need two 1/16 inch allen keys to loosen and tighten the screws. Our Lynx model uses 6-32 screws with T15 (Torx drive) heads; usually a single driver is all you need. You will also need a thin yet strong knife or putty knife to aid in separating scales from the tang. Prepare a clean work space, like a table or bench top, so that if you drop any of the small parts, they don’t get away. Lots of light helps too. It is a good idea to tape the edge of the blade so that you don’t cut yourself. A cutting board can be used as the actual work surface to avoid possibly marring a nice table top. Lay the spine of the knife on the work surface and insert one of the hex keys on either side of one of the sets of screws (eg the front pair). Ensure the tools seat all the way into the screw heads and are nice and square to the head before applying turning force. The screw steel is not as hard as the tools and can be stripped out quite easily if the hex keys aren’t all the way into the sockets. Turn one of the tools counter-clockwise while holding the other side from turning. The screw should break free and one side or the other will unthread from the inner pin. Repeat for the other pair (or pairs, depending on the model) of screws. Try to thread out all the remaining screws. If the inner pin turns instead of the screw, it may be possible to push the pin and remaining screw out together with either a 4mm or 5/32″ rod, drill bit or a small torx or other screwdriver. Most likely the pins will be quite tight and not easy to push out (accumulated grime). In that case, if you can get the screws out of one side of the knife, that scale can be teased off the pins. With all the screws removed from one scale, gently insert a thin putty knife or other thin blade between the tang and the scale near the front of the handle. Try to avoid damaging the old scale in case you want to use it again in the future. With the blade under the scale, slide it toward the back end of the handle to create a gap. Keep moving to where the gap between scale and tang is the smallest (typically from one end to another) and gradually pry the scale off. Remove the second scale using the same technique. TIP: screws can be very useful push tools when removing stubborn pins from tangs or scales: just insert an already removed screw a turn or so into the end of the pin you wish to push on. Clean the tang of the knife of any accumulated grime. A wash cloth or perhaps a scrub pad should get most of it. Get your screws and pins ready. If the old hardware is in good shape, try to reuse it (particularly the pins because you should not have issues getting them to fit in the tang). Test the fit of the pins in the tang holes. If they do not press in with finger pressure when squarely pushed into the tang, use some very fine sandpaper or a sharpening stone (220 grit or so) to remove any burrs from the end corners of the pins. If pins don’t push in, it’s usually because they are hanging up on the edge of the tang hole. If you installing wood scales, it can help to have some paste wax handy to apply to the joints between the tang and scales as an extra measure of protection to minimize water incursion under the scales. Leave the pin sticking out far enough so that it will extend through both the tang and into the mating scale. Check that the pins are reasonably square to the scale. With the screws all started, you now want to adjust them so they protrude approximately equally from each side (ie that the inner pin is centred). Push the screw heads against the work surface as needed to center each hardware set. Use the two tools in opposing screws and tighten equally until the screw heads make snug contact with the scales. A gentle snugness is all you need. Be careful not to over tighten or you may either pull the screw through a wood scale (or split it) or risk stripping the screw head. Inspect your work. Make sure there are no significant gaps between handle and scales that would indicate something got trapped underneath. On wood handles, we recommend applying some paste wax at the joint between scale and tang along the perimeter of both scales to seal water out as much as possible. What screw sizes do your knives use? There may be times when you need to or want to disassemble your knife and you’d like to know the screw sizes involved. For our Skaha folder, because of its moving parts and internal bearings, disassembly for service is more likely than for our fixed blade models. We do have an article on typical fixed blade handle removal and replacement. Skaha Folder: pivot screws have Torx T10 heads. thread size is 6-64, pivot diameter is 3/16″.. Standoffs are 3/16″ diameter, 4-40 thread, Screw heads are T8. Pocket clip screws are 2-56 thread with T8 heads. Alder, Sitka: 3/16″ diameter standoffs, 3/8″ long with 4-40 threads. Front screws are 5/16″ length flathead with 1/16″ hex socket drive. Mid and rear screws are 3/8″ long. Kermode 6 and 9″: 3/16″ diameter standoffs, 3/8″ long with 4-40 threads. Front screws are 1/4″ length flathead with 1/16″ hex socket drive. Mid screws are one each of 5/16″ and 3/8″ length and rear screws are 3/8″ long. Trillium and Mallard: 3/16″ diameter standoffs, 5/16″ long with 4-40 threads. All screws are 1/4″ length flathead with 1/16″ hex socket drive. Lynx: 1/4″ diameter standoffs, 3/8″ long with 6-32 threads. Front screws are 1/4″ length flathead with T15 drive. 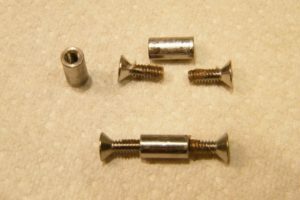 Mid and rear screws are 5/16″ long. If you need any small hardware or have further questions about it, please contact us. How do I maintain my Skaha Folder? Keeping your Skaha folder running smoothly and cutting superbly is not difficult. Like any other knife, your Skaha works best when you keep it sharp. And because it has moving parts, cleaning, adjustment and lubrication is something you can expect to do occasionally. The steel we use holds an edge exceptionally well, but does need maintenance to stay sharp. Many systems will work. We cover a variety of sharpening tools on our sharpening page. Avoid pull through sharpeners that use tungsten carbide blades to peel away metal; they remove too much steel and don’t produce a good finish. It’s important to be aware that several components in the Skaha are made with martensitic stainless steel (heat treatable types of stainless) Such steels are highly stain resistant, not stain proof. They can corrode in very extreme environments, such as prolonged exposure to salt water or strong acids. As soon as possible after exposure to corrosive environments, wash the knife as described in the next paragraph. An important part of folding knife maintenance is keeping the moving components clean and lubricated to insure smooth operation. If your Skaha feels gritty or stiff it probably needs a thorough washing and some lubricant. Wash it in warm soapy water. Work the blade back and forth under the water to help get all the dirt out. If possible spray into the pivot area with strong pressure (eg. kitchen sink faucet with spray mode) and move the blade through its travel. Do this until the gritty feeling is gone. Then rinse any remaining soap away and allow to air dry. You may blow the knife out with compressed air to speed drying. Once dry, lubricate the pivot, bearings, and detent ball with a few small drops of light oil. A fine tip oiler like the one we sell on our website is very useful for reaching into this area while the knife is assembled. Washing for long enough will remove almost any dirt but if this procedure doesn’t cure the grittiness of your knife, you may partially disassemble it to clean and lubricate See below. For maximum smoothness and to minimize wear on the bearings, the pivot screws must be correctly adjusted. We adjust the pivot before shipping and it should remain properly adjusted for quite awhile. However, eventually wear and other factors cause the pivot screws to require adjustment. The pivot screws should be just tight enough to eliminate lateral (side to side) “blade play”. Any tighter can cause the action to become stiff and will cause unnecessary wear on the bearings. To check for play, gently push and pull sideways on the blade when locked open. You shouldn’t see or feel any obvious slack. If slack is present, tighten either pivot screw very slightly. Repeat until play is gone. If the blade’s travel feels stiff and no lateral play is present, your pivot may be too tight. In that case, loosen until you get play then tighten as described. To take the Skaha apart for cleaning, follow the steps below. We have also made a video showing the process. Note: The Skaha pocket clip screw(s) serve the dual role of securing the clip and anchoring the lockbar to the handle scale. We recommend you leave the pocket clip installed during service. If you must remove the pocket clip, don’t remove the lockbar from the scale unless absolutely necessary; re-installing it improperly can cause your knife to function incorrectly. Also, repeatedly removing and reinstalling the lockbar could eventually cause slack in the press fit. If you decide to use the knife without a clip, the screw(s) must be reinstalled to make sure the lockbar stays secured in the handle scale. The screw(s) are just short enough that they won’t interfere with the blade but it is a good idea to check the clearance after assembly. Before you start. Make sure you are working on a clean surface. Have a small container or dish ready for small loose parts. Don’t work over an area where small parts could go missing easily. You’ll need torx screwdrivers with T8 and T10 drives, as well as a 1/4″ or wider flat tip screwdriver that’s covered with two layers of electrical tape ( to prevent marking). Have some paper towels or cloth handy as well as light oil with a fine tip needle applicator. 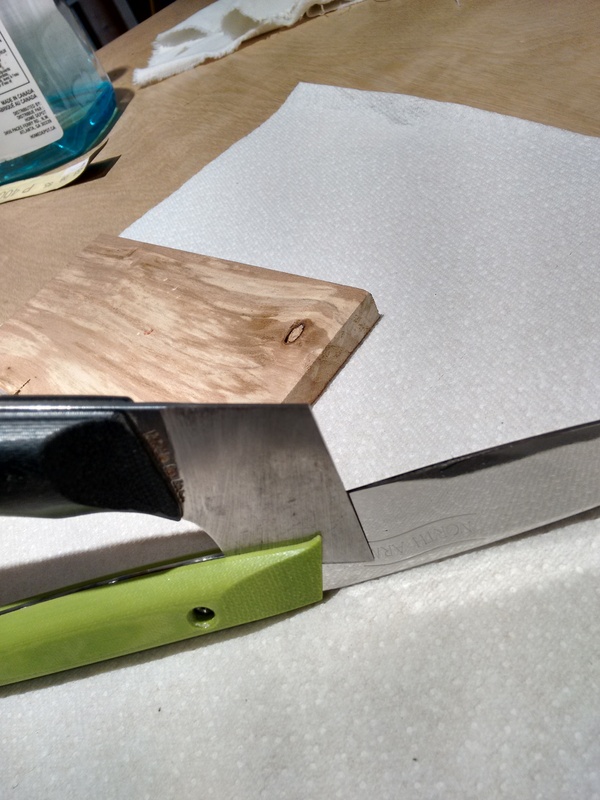 Tape the cutting edge of the knife with a a couple of layers of masking or electrical tape before you go further. This protects both you and the edge. With the blade closed, loosen and remove the rear spacer screws from the side opposite the pocket clip. The scale should then come free of the pivot, stop pin and the two spacers. As the scale is lifted off, the bearings are exposed. Each side of the blade has a thin washer which goes into the bearing pocket on the scale. The caged bearing is sandwiched between the washer and the blade. Keep track of the part order and orientation of the bearings and washers. The washers have a shinier side which should face the bearing. Wipe the pivot pin clean and rinse the bearings with solvent (isopropyl (rubbing) alcohol is good because it evaporates quickly and is not too aggressive), and pat dry with a lint free cloth. Wipe off the lockbar (still attached to the scale) and other exposed surfaces of the blade and scales, using the same solvent, as needed. To reassemble, make sure the stop pin is in place on the lockbar side scale (it may have pulled out with the scale you removed. Assemble the parts in order onto the pivot, oiling each bearing with a couple drops of oil. Also add a drop or two inside the pivot hole in the blade. Lower the loose scale evenly into place onto the mating holes where the pivot, stop pin and spacers protrude. Be very careful that these all align and gently coax the scale into place with hand pressure only. Check for parallelism of the scales and correct as needed. Install the 3 removed screws and fasten lightly. Seating the stop pin fully is crucial. Usually this can be achieved by squeezing hard on both handles right above the stop pin. You may also carefully use a clamp or other tool to carefully apply pressure to this area. Steel will scratch G10, keep this in mind if you use a tool. Tighten the spacer screws snugly but avoid over tightening. Are you a Custom Knife Maker? We are not a custom knife maker; we concentrate solely on producing our own lineup. If you have a dream project for a custom knife you’d like see come to life, we are not the ones to do it. We suggest you do an online search for custom knifemakers within your region or as far out as you have to look to find someone with the capabilities and desire to do your project, and then start a dialogue. You’ll find out soon enough if you think you can work with that maker. Alternatively, if you have the tools and the basic skills, you could consider making your own knife. You can find plenty of information online to guide you. How does your shipping work and what does it cost? We can ship to most places but it can get expensive outside of North America. See Costs below. Shipments to Australia and many western European countries that support tracked parcel shipments via national postal systems are fairly straightforward and not outrageously expensive. But even some European destinations are not served by tracked postal systems. In those cases Canada Post uses Fedex and a priority service to do deliveries and tracking and it starts to get outrageous. At that point you have to get creative, as in: do you have a friend in North America who is travelling your way soon? Customers outside of the USA and Canada should verify before they place an order that the type of knife they are purchasing can be imported to the country where they live. In general, the kitchen and fixed blade knives we sell should not be a problem, but some countries may have rules about maximum blade lengths, or other restrictions, so if you are in doubt, please check the applicable laws in your jurisdiction. We ship from metro Vancouver British Columbia. Generally the farther away you are the more it costs. We ship primarily via Canada Post (though DHL express is an option for USA orders). Our checkout page does a look-up at Canada Post for exact shipping charges to your address, so you will see immediately the total cost to ship. If the Canada Post website isn’t reachable when you place your order, you will still see a flat rate shipping option for USA and Canada destinations. In such cases we will only charge you what it costs us to ship (usually less than this) and refund the difference to your credit card if it is more than $1. Within metro Vancouver shipping is usually about $8; other BC locations about $12-15 and other parts of Canada and the USA it’s normally $15-20. To much of western Europe and Australia, shipping costs in the $50-70 CAD range for a single knife and maybe $100 for 5 knives, so it gets less per knife in numbers. For countries not served by tracked postal services, costs can range up to $170 or more for a single knife that may be worth $59, so not practical, unfortunately. You can check shipping costs on our cart page by supplying a country and postal code. If you have other questions please email us. For orders of $500 or more to Canadian destinations you will see a free shipping option on the checkout page. We only offer trackable type shipping methods. This means that you will get an email with your tracking number and be able to follow its progress to your address. How do I care for the wood handles on your knives? We finish the wood handle scales with a highly water resistant coating which will help to preserve the wood’s natural beauty for years to come. To maximize the life of the finish, follow these care instructions. Hand wash and dry; steering clear of scrub pads and abrasive cleaners that would mar the finish. Do not put in the dishwasher!